Improve the efficiency and effectiveness of Local Authorities engaging with the Small Sites/Small Builders program. Increase quantity and quality of Small Sites going through the Small Sites/Small Builders program. A – Handover and functionality updates: Transferring control to Local Authorities to enable them to drive the process themselves using the small sites database. To do this we will have to increase the functionality of our current platform and enable a 'shared' ownership and permissions and editing capability contained within the end product. This is a necessary step to Local Authorities taking control of the process. B – Alignment of information with GLA Small Sites/Small Builders application requirements in terms of content, format and compatibility between platforms. C – Direct application: Integration of functionality allowing Local Authorities use the sm\all sites database to directly apply for GLA funding. This would require GLA to be on the receiving end of applications via the Database. The above diagram shows the sequential process/timeline required for every site as well as the key parties involved. The Local Authority remains in control, engaging with the GLA for funding or consultants incrementally throughout the process. 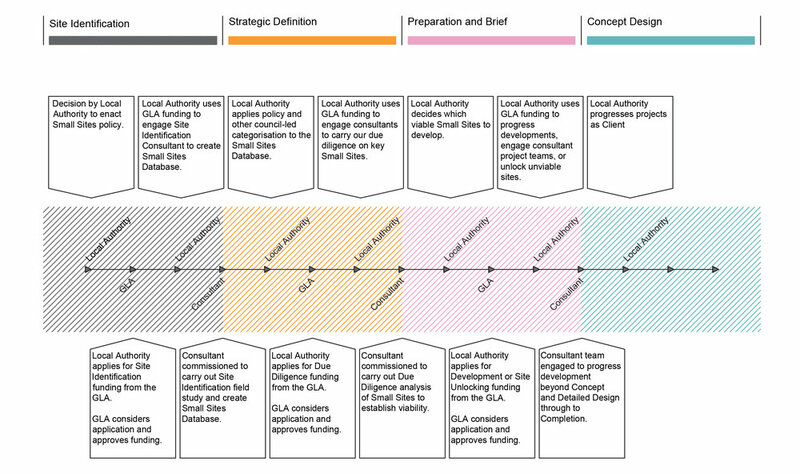 The process can be understood as a dialogue as information is passed back and forth between the Local Authority, GLA and consultants through the lifetime of the Small Sites engagement process. In addition to the Local Authority engagement process, community-led housing groups should be able to use the platform to engage with the London Community Housing Fund. The current Community Group Small Sites engagement process will be facilitated within database allowing Community Groups and Community-Led Housing London work closely with Local Authorities and the GLA to deliver more community-led housing developments. The diagram above tries to illustrate the complexities around managing large quantities of Small Sites, here depicting one application/process per each of the 32 London Boroughs. This problem grows dramatically when the quantity of Small Sites within each Borough is considered, with thousands of potential Small Sites across Inner London alone. Visible above are the pinch-points where information incrementally converges with the GLA for funding approval, within which there is an opportunity to improve efficiencies, thereby increasing the quantity of Small Sites unlocked through the Small Sites / Small Builders program. The current Small Sites Database is focused on providing an organisational reference tool for Local Authorities. Key information gathered through a site identification field study is arranged in an easily readable format. Information is gathered using Collector App and the database is created using ArcGIS Online ensuring compatibility with existing Local and City Authority systems. In addition to the database shown above, a summary report that quantifies the information in it's entirety is provided to assist Local Authorities develop strategies for utilising the Development Opportunity Database in the most efficient and effective manner. The Small Sites Map provided allows the Local Authority to search for particular sites dependent on characteristics such as Potential Homes and Site Area. Functionality: Allow Local Authorities/End Users update information within the Database allowing for policy implementation and prioritisation of strategic objectives, putting the Local Authority in control of the database and Small Sites engagement process. Format: The Database will be reformatted to reflect the GLA 'Expression of Interest for Public Landowners of Small Sites' application, both in content and arrangement. Application: Integrate funding application function into Database allowing Local Authorities to apply for GLA funding directly via the platform. Efficiency: Encourage and facilitate more and more frequent engagement by improving efficiency and effectiveness of existing processes. The existing Database already provides much of the requirements, with minor upgrades necessary to integrate additional functionality. In addition to the updates to the Database as outlined above, we propose refining our Site Identification methodology to ensure the standard of Small Sites meet the requirements of the GLA Small Sites Program.